the global quest to generate commercial energy through nuclear fusion, the same process that powers the Sun, took a concrete shape with France being selected as the host for the International Thermonuclear Experimental Project (iter). The decision came after 18 months of wrangling with Japan -- the other contender for the project -- that ended at a June 28 meeting of the iter funding countries in Moscow. But Japan acceded only after winning special favours, including a chance to head the us$12 billion project. Besides Japan, the other countries involved in iter--the biggest global science collaboration -- are the us, Russia, the eu, China and South Korea. Of these, the us, Russia, Japan and the eu have individually pursued nuclear fusion reactor programmes and so their coming together can hasten research. Nuclear fusion is projected as an alternative to fast-depleting fossil fuels. Unlike nuclear fission, fusing together hydrogen nuclei to produce helium does not leave behind long-lasting radioactive waste. But the reaction occurs only at temperatures as high as 100 million degree Celsius. The first goal of iter, expected to be operational by 2015, would be to sustain a fusion reaction for 500 seconds or more to produce up to 500 mw of energy. But even in the most successful experiment yet, in 1997, the Joint European Torus, the world's largest fusion reactor, could only achieve 16 mw, that too, for less than a second. The experiment's fusion power gain value, which is the ratio of input to the output power, was 0.7. In other words, the European scientists used more power to produce less, an uneconomical proposition for any commercial energy venture. Critics feel modern science is chasing an unrealistic goal. There is a joke about fusion that it has been "just decades away" for several decades. Activist organisation Greenpeace alleges the nuclear option stalls real action to combat dangerous climate change by taking away the money for solutions that are ready and commercially available at a large scale, such as wind energy. 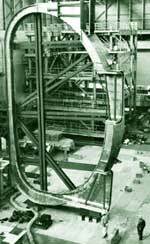 Slow progress The concept of iter emerged in 1985 at a meeting in Geneva between the us and the erstwhile Soviet Union. In almost two decades, the only progress on iter has been a decision on its location. Several factors have been responsible for the slow progress. First, with the energy crisis in the 1980s behind them, iter sponsors temporarily lost interest in the project. Also, after the Chernobyl accident in 1986, the word nuclear became anathema and iter became a victim of the anti-nuclear protest. The us withdrew from iter in 1999. Canada followed in 2003, when the us rejoined iter. China and South Korea also joined iter in 2003. Of the total investment in the project, the construction of the reactor, at Cadarache in southern France, is estimated to cost us$5.5 billion. Once successfully installed, the reactor will be run for 20 years while evaluating the commercial prospects of this technology. The eu will supply half the funds required for building the reactor, with France being the main contributor. The other five partners will contribute 10 per cent each, in the form of equipment and humanpower. An exception will be made for Japan, which will get 20 per cent of the manufacturing orders and supply one-fifth of the project's scientists. The eu has also agreed to support a Japanese candidate for iter' s director-general. Moreover, Japan will host a parallel nuclear fusion programme (with financial and technical support from other partners), under which a prototype fusion reactor, called Demo, will be built if iter is successful. Japan will also set up a facility to develop and test building materials that would withstand the high temperatures required for fusion. There are efforts to rope in other countries with experience in nuclear sciences, such as India and Brazil. David King, the chief scientific adviser to the uk government, had made a formal proposal to India during his 2003 visit. But both India and Brazil have made it clear they do not intend to put money in the project. Indian scientists feel that they might be able to chip in with technology and human resources.